Medusa Affittacamere i Livorno, Italien: Reservér nu! The owner, Claudia, is very welcoming and helpful in everything you might require to enjoy your stay. The shared bathroom is traditional and spacious. 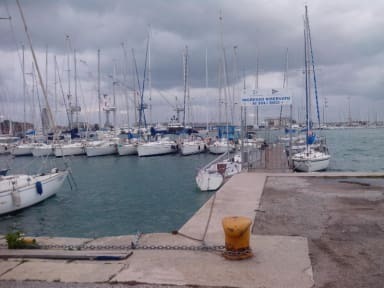 Medusa Affittacamere is close to everything that Livorno has to offer. Just steps from the door is a gelataria and many a cafe. There are pharmacies and many shops on the same block as the hotel for any needs that may arise. The central market is right around the corner, only a few minutes walking. A bit further and you reach Piazza Grande and just beyond is the marina and then you are on your way to the famous Viale Italia. Along the Viale Italia you find stunning sunrises and sunsets, gorgeous sea views, the Acquario Di Livorno, Terrazza Mascagni, and many bathing stations including Bagni Nettuno and Bagni Tirreno. Just a couple of kilometers west of Medusa Affittacamere is the historic Fortezza Nuova, the old fortress. Around this monument you can see the beautiful architecture surrounding the canals. Check in from 16:00 to 23:00. Please contact the owner with your arrival time once you have made your booking.